Bahia Honda State Park is not just a day out with the family. This is one of those places that for many is what the Florida Keys is all about. You see the state park is often listed as the custodian of the greatest beach in all the United States of America, which makes it…….well let’s just say near the top of things to do whilst visiting the islands, and definitely at the top of the Florida Keys Campgrounds you can stay at. It’s a true gem of a place, so it’s somewhat surprising that they let you kip down for the night under canvas. Many places will not be so accommodating even though they have a fraction of what Bahia Honda has for you to enjoy. But let you sleepover they do. 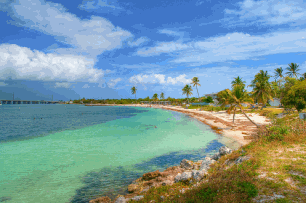 So let’s give you the lowdown on what this wonderful location in Big Pine Key has to offer to make your visit the magical and memorable experience you would expect from Bahia Honda State Park. 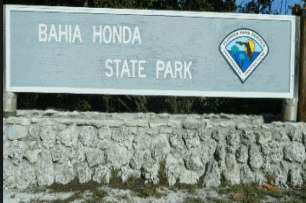 How To Get To Bahia Honda State Park? So hopefully I have now whet your appetite and you and the kids are throwing your tents, sandals and trunks into the car and driving as fast as the speed limit will allow. Well with most things to do with the Florida Keys you will be heading down US1 or the Overseas Highway as it is known. Making sure that you are keeping an eye on the useful Mile Markers you will see all the way down the highway leading to Mile Marker 0 in Key West, you will find the park signposted around Mile Marker 37. Just turn in and pretty much you are there. So that’s nice and simple isn't it! Stretching over 2 ½ miles, the 524 acre state park allows anyone wishing to stay at the site three choices as to how they camp. If you are visiting Bahia Honda in a camper van, or large motor home then you will be placed firmly at Buttonwood. These sites are roomy and perfect to drive up, settle down and relax. Visitors to the park, can bring their own food and picnic on the sands, whilst the waves gently slip up onto the beach. Afterwards (once your food has gone down....yeah thanks mum) simply take a swim in the crystal blue waters, or just lay a towel down on the sands and relax your cares away. Whilst anyone interested in fishing the Florida Keys can either cast their lines from the shore, or instead bring their own boat, which can be launched down at the boat ramp. Perhaps you have a simple tent, or small van? Sandspur will be the place for you. This part of the park sits deep in a tropical hardwood hammock, the park are extremely choosy as to who are allowed to camp here. It is a lovely part of the site, so I don’t blame them at all for trying to keep it as nature intended. 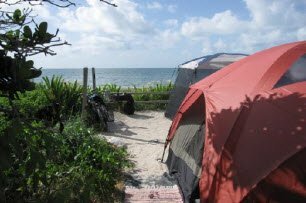 And this choosiness helps to keep the best of all Bahia Honda State Park special for anyone who does get to stay there, so only one car and one tent per site are allowed. For both Buttonwood and Sandspur all the sites have water, and over half have electricity. If you requiring electricity then it is best to contact the site before arriving just to make sure. On the other side of the Bahia Honda Bridge there is the last of the three areas: Bayside. All of the sites here only have water available and most are taken up by tents only, as the bridge is very tight for most vehicles. It’s actually only six feet wide. So it’s on foot for anyone camping here. But that kind of adds to the adventure really. You are really left with a feeling of getting away from it all. Which is why you have gone camping in the first place…right? Although at the beginning of the page, we said that the park was the custodian of the best beach in the whole of America, actually we lied a bit. 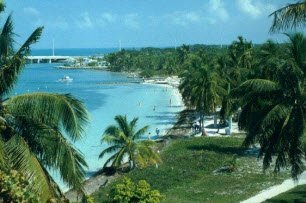 You see to be 100% factually correct, Bahia Honda State Park beach is actually made up of several gorgeously sandy white tropical beaches. Perfect for you to explore, and sit down on to watch the amazing sunsets with families and love ones. Having the sandy beach at Bahia Honda State Park, and a naturally sandy beach at that, is quite unusual too. All around the islands that make up the Florida Keys, the beaches In the Florida Keys are generally quite rough on your feet, due to the pebbles and tiny bits of coral that they are made of, unless the local authorities make the effort to import thousands of tons of sand every now and again. And most of them do, as we all like a bit of tender sand love on our toes. This is the smallest of all the beaches found at Bahia Honda State Park. It's located northwest, over on the other side of the island. Like most of the beaches, there are to be found well maintained showers and changing areas, which is great as you start to make your way home after the day on the sands. Who wants to sit in the car with sand rubbing areas that shouldn't be rubbed? This beach is perfect for non-swimmers, or people who just like a bit of a paddle, as it is without doubt the shallowest of all the beaches, and is right on the islands southerly side. It is quite famous for having a sand bar that sits a little way offshore. Nice and shallow it can be used to walk safely out in the waters that surround the park. Which is great if you have children with you when visiting. The restroom on the beach can get quite busy as they are for combined use with Calusa Beach. The largest of all the beaches to be found in the park is Sandspur. Sandspur is almost directly opposite Calusa, as it to be found southeastly on the island. If you want to clean up after your day at the beach, you can find some well maintained and refreshing showers, unusually for beaches not salt water ones either, with three pavilion type changing areas. This is one of the most popular activities whilst at the park, and is one for all the family. Get on one of the bikes that you can hire at the parks headquarters and pedal at your own pace around the 3.5 mile paved road. This is not a hard cycle at all, and is great fun to do. However one word of warning, if you think that you are going to get on a bike and cycle wherever you want to go then you will be mistaken. To make sure that damage to the park is limited as much as possible, bikes at Bahia Honda State Park are not to go onto the boardwalks, footpaths, or on the trail that winds it way to the Old Bahia Honda Bridge. But you will still have a great time I promise you. The thought of getting onto your own canoe and paddling out into the Florida Keys waters might be a frightening one, but really you have no need to worry. The ocean kayaks, which you can hire at the concessions are remarkably stable, and even for the most inexperienced should be an activity that needs little time to master. They can be launched from the boat ramp on the gulf side, or over by the parking lot near Loggerhead Beach. If you are experienced and have your own canoes then you can bring these with you and launch them at the Bahia Honda State Park locations previously mentioned too. Didn't You Have Someone Else On The Back When You Started? The waters at Bahia Honda State Park are generally perfect for swimming, with very mild currents and clear waters. This only changes when the wind blows and the sand and sediment gets stirred up a bit. But if you are fancying having a swim but don't really want to travel all the way home from Bahia Honda State Park feeling salty and sandy then you can use the cold and refreshing showers at the park. These can be found at Sandspur and Calusa beaches. One of the most recent additions to many parks activities is the practice of Geo-Seeking. When this was first brought to my attention I had no idea how much fun it could be, but it is now one of my favourite pastimes not just at Bahia Honda State Park but anywhere in the world. By using the GPS function, which is available on most mobile phones nowadays you can go on your very own treasure hunt, to find four geocaches, which are small markers scattered around the park. If you are interested in downloading an official app, then you can simply go to www.geocaching.com who can provide you with more information as to the worldwide appeal of this activity. $8.00* per vehicle. Limit 2-8 people per vehicle. $2.00* Pedestrians, bicyclists, extra passengers, passengers in vehicle with holder of Annual Individual Entrance Pass. $4.00* Single-occupant vehicle or motorcycle. *Plus $.50 per person Monroe County Surcharge. The park is open daily from 8:00 a.m. until sunset. The Concession Building is open 8:00 a.m. to 5:00 p.m.